Several weeks ago, Studios Central operator Matt Hochberg put together a great article on the Academy of Television Arts and Sciences Hall of Fame, which can be found in the Echo Lake area of Disney’s Hollywood Studios. This overlooked showcase was added to the park in 1993 using bust replicas from the original West coast Hall of Fame courtyard. The bust themselves feature a wide variety of personalities, many of whom have ties to The Disney Company, and plaques along the back wall give an even grater depth to the television legends’ story. Today, I thought we would revisit 1992 and look at the concept art and publicity blurb Disney released about this incoming salute to the stars we share our living rooms with. 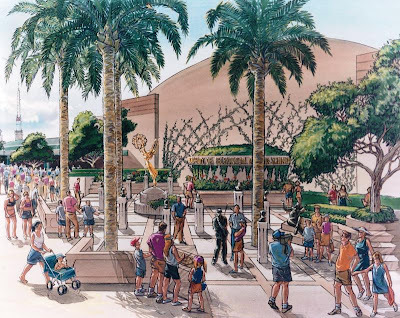 The Disney-MGM Studios Theme Park is the East Coast home for ATAS’ new Hall of Fame Plaza, opening in 1993. 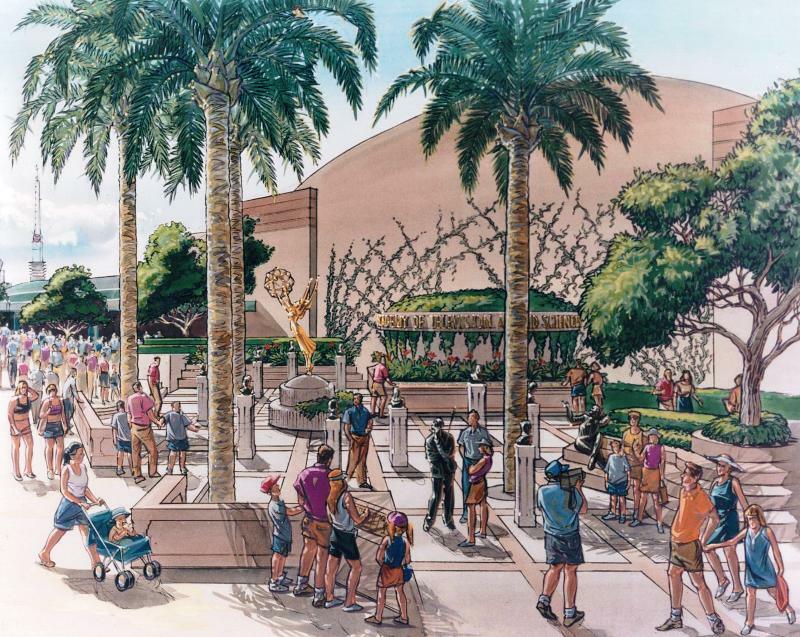 Designed as a striking, terraced-garden exhibit, the Plaza will feature a golden Emmy surrounded by life-sized statues of TV legends. The area is modeled after the existing plaza at ATAS’ North Hollywood headquarters, which features sculptures of Bob Hope, Jackie Gleason, Milton Berle, Lucille Ball, Sid Caesar, Carol Burnett, Jack Benny, Johnny Carson, Mary Tyler Moore and others. Thanks for the link! I love looking back on concept art like this.